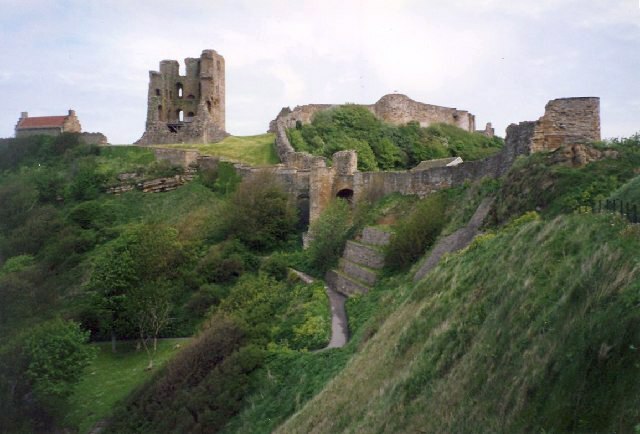 Notes: Scarborough Castle is a former medieval Royal fortress situated on a rocky promontory overlooking the North Sea and Scarborough, North Yorkshire, England. The site of the castle, encompassing the Iron Age settlement, Roman signal station, an Anglo-Scandinavian settlement and chapel, the 12th-century enclosure castle and 18th century battery, is a scheduled monument of national importance. Fortifications for a wooden castle were built in the 1130s, but the present stone castle dates from the 1150s. Over the centuries, several other structures were added, with medieval monarchs investing heavily in what was then an important fortress that guarded the Yorkshire coastline, Scarborough's port trade, and the north of England from Scottish or continental invasion. It was fortified and defended during various civil wars, sieges and conflicts, as kings fought with rival barons, faced rebellion and clashed with republican forces, though peace with Scotland and the conclusion of civil and continental wars in the 17th century led to its decline in importance. Once occupied by garrisons and governors who often menaced the town, the castle has been a ruin since the sieges of the English Civil War, but attracts many visitors to climb the battlements, take in the views and enjoy the accompanying interactive exhibition and special events run by English Heritage.